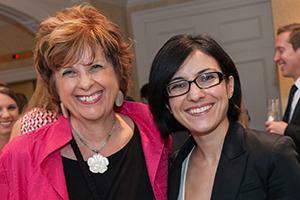 Kathryn Montgomery, left, with PhD student Tatevik Sargsyan. After fifteen years of research and academic leadership at American University School of Communication, Dr. Kathryn Montgomery is retiring. “As a prolific and preeminent thought leader in digital media policy, [she is] considered one of the world’s leading scholarly pioneers in studying though social media engagement and digital privacy,” said SOC Dean Jeff Rutenbeck. Montgomery has written and published articles and reports about the role of media in society. Her research focuses on youth engagement with digital media, contemporary marketing and advertising practices, and the politics of entertainment television. In 2011, Montgomery founded the Ph.D. program in Communication and helped SOC become nationally ranked and become a respected center for research and education. Under her leadership, enrollment in the BA in Communication has increased by 50 percent. Montgomery is the author of two books: Generation Digital: Politics, Commerce, and Childhood in the Age of the Internet (MIT Press, 2007), and Target: Prime Time – Advocacy Groups and the Struggle over Entertainment Television (Oxford University Press, 1989). She has also produced nearly 50 peer-reviewed articles along with countless research reports. She conducts research on interactive food and beverage marketing and examines how companies, the Internet, video games and phones target children and adolescents. Before coming to SOC, Montgomery was the co-founder and President of the nonprofit Center for Media Education from 1991-2003, where her research and advocacy on electronic privacy and e-commerce was key to Congressional passage of the 1998 Children’s Online Privacy Protection Act (COPPA). COPPA was the first federal legislation to protect the privacy of children on the Internet.